Summary: When 11-year-old Rocco is accused of stealing from his parents’ landlord in Italy, he is sold off to a padrone who brings him to New York City to work as a street musician. In reality, he’s little more than a beggar and a slave, forced to turn over his earnings to the padrone in return for minimal food and shelter. 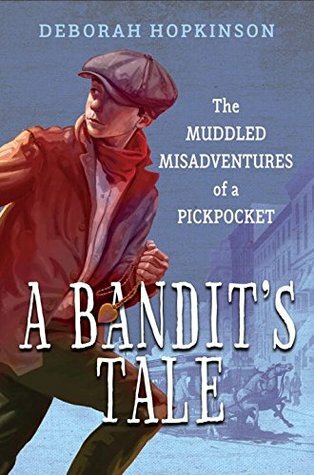 Hungry and desperate to return home, Rocco joins a band of pickpockets. He turns out to be a pretty good bandit, and for a while, it looks like he may have found a way to get enough money for a return passage to Italy. But a bungled robbery results in his arrest, and Rocco finds himself in a reform school on an island off of Manhattan. A daring escape during the Blizzard of 1888 almost kills him, but he is a rescued by a kind Irish man and his daughter. Living with them begins a chain of events that puts Rocco’s life back on track and allows him to help other immigrant boys caught in his circumstances. Back matter includes more information on the historical period covered and about the picaresque novel. 304 pages; grades 3-7. Pros: Rocco’s adventures cover a dizzying array of real and imagined people and places from late 19th century New York City. He’s a scrappy, likeable narrator, and kids will learn a lot of history while enjoying a page-turning set of adventures. Cons: The author’s notes seemed a bit too long to hold most kids’ attention.